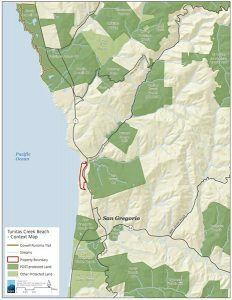 (Palo Alto, Calif.)—Peninsula Open Space Trust (POST) announced today the purchase of a 58-acre beachfront property, at the intersection of Tunitas Creek Road and Highway 1 in coastal San Mateo County, for $5 million from the V Trust LLC. The goal of this acquisition is to preserve, rehabilitate and prepare the property for safe public use that respects the local environment. The beach is located just north of San Gregorio at the mouth of Tunitas Creek. Situated along a bluff at the mouth of Tunitas Creek, the site had been used for centuries as an Ohlone seasonal village and was a stopping point on the Spanish Portola Expedition. The entire property had been in private ownership for more than 100 years, but has become seriously environmentally degraded due to unsafe and unmanaged public use. Most recently, it has become popular via social media as a place for large, overnight campouts. 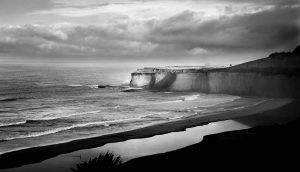 This has caused significant environmental degradation to the sensitive cliffs and the Tunitas Creek corridor as well as unsanitary conditions on the beach. While POST is purchasing the southern parcel, county staff and POST are cooperating closely with the property owners on the north side of the beach who are in full support of this plan. In July of 2017, the San Mateo County Board of Supervisors approved enforcement of prohibitions such as no camping and fires that will protect the coastal environment and ensure visitor safety. Tunitas Creek Beach currently has no facilities and is only accessible via a steep, eroded trail on the property or through the environmentally sensitive Tunitas Creek corridor. The beach is home to a federally protected snowy plover. The restrictions are similar to those in place at many County parks and are being enforced by the San Mateo County Sheriff’s Office. The most immediate changes the public will see to the property support emergency access for public safety, with full public access coming later. Photo by Evan Winslow Smith. 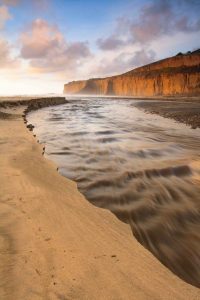 “Places like Tunitas Creek Beach belong to everyone,” said Kari Mueller, Vice-Chair of Surfrider, San Mateo County Chapter. POST is looking to raise $10 million from the community and community-based organizations to fund the purchase and environmental restoration of the cliffs and beach. These funds will also cover the design and construction of safe public access trails, parking, restrooms, and possibly, a ranger station. Restoration of the creek corridor will require additional funding. Working in close coordination with San Mateo County Parks, it is hoped that the improvements will be completed and the property open to the public as a County Park within three years. Protection and management of the property is expected to cost the County an additional $10 million dollars over ten years. The property also offers an opportunity to complete a gap in the California Coastal Trail. This project is funded in part by the Gordon and Betty Moore Foundation. To participate in POST’s fundraising efforts, visit openspacetrust.org/donate-tcb or contact Megan Derhammer at mderhammer@openspacetrust.org. POST is a leading private, nonprofit land trust that protects and cares for open space, farms and parkland in and around Silicon Valley. Since its founding in 1977, POST has been responsible for saving more than 75,500 acres as permanent open space and parkland in San Mateo, Santa Clara and Santa Cruz counties. Visit openspacetrust.org for more information. San Mateo County Parks manages parks, preserves, trails and historic sites to preserve public lands and provide opportunities for education and recreation. The Department’s 22 sites are located throughout the County and encompasses more than 16,000 acres that represent the region’s wondrously diverse natural settings. Learn more about San Mateo County Parks at http://parks.smcgov.org/. For more information about rules currently enforced at Tunitas Creek Beach, you can find them at parks.smcgov.org/tunitas-creek-beach.